Summer signing 2014. From Oldham Athletic. Signed from Barnsley on 1/7/2017. On loan from WBA, in January 2017. Signed in summer of 2017. On loan from Burnley 31/8/2016, permanent transfer in January 2017. Signed from Sheffield United in August 2016. Congolese, signed in June 2015, from Sheffield Wednesday. Signed on 31/8/2017, free agent - left Blackburn following their relegation. 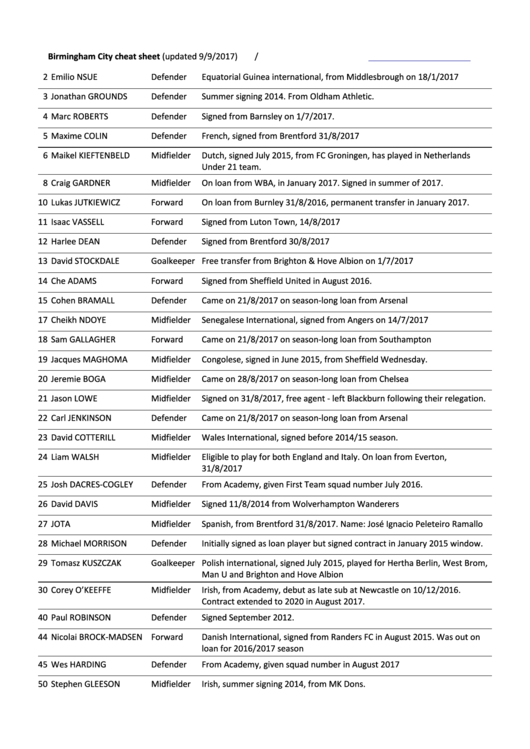 Wales International, signed before 2014/15 season. From Academy, given First Team squad number July 2016. Initially signed as loan player but signed contract in January 2015 window. Irish, from Academy, debut as late sub at Newcastle on 10/12/2016. Contract extended to 2020 in August 2017. Irish, summer signing 2014, from MK Dons.